The turnaround story occupies a special place in executives’ hearts. When a company that’s been written off as dead returns to profitability, other business leaders clamor to look behind the curtain — in part to get insight should they find themselves in a similar position. Often, a charismatic leader or breakthrough innovation is hailed as the secret ingredient in corporate transformation. But recent work from Gregory Carpenter, the James Farley/Booz Allen Hamilton Professor of Marketing Strategy, shows the prevailing wisdom is mostly a myth. Carpenter and his co-authors, former Kellogg professor John Sherry Jr. and Gary Gebhardt ’05, associate professor of marketing at HEC Montréal (École des Hautes Études commerciales de Montréal), spent more than a decade studying companies trying to reinvent themselves. 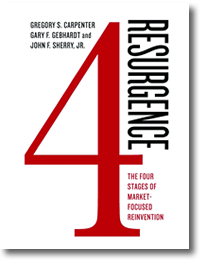 Their book, Resurgence: The Four Stages of Market-Focused Reinvention (Palgrave Macmillan, February 2014), provides an in-depth look at seven companies — among them iconic corporations such as Harley-Davidson and Motorola — and how they reinvented themselves with a market focus. All of the firms took similar actions, including reorganizing and adding new people and incentives. Despite taking the same actions, some failed while others succeeded. What made the difference? “Rather than leadership being the key, all the successful companies made decisions in the same sequence,” says Carpenter. A market-focused reinvention does not begin with the customer. Many executives look externally first to address the immediate problems. Usually, the real problem is deeply rooted in the culture of the organization. Successful firms think deeply about the culture, particularly the values, they need to create to reignite growth and thrive. Reconnecting with customers is a firm wide responsibility. In many organizations, the customer perspective is isolated in marketing. In firms that successfully reinvent themselves, understanding of the customer throughout the organization creates a shared understanding and a common basis for collaboration. A market-focused reinvention shifts power from the very top. Armed with shared knowledge about the market and enabled by a new culture, executives and employees throughout the organization are empowered as never before. This shift creates momentum for more formal changes, such as organization and compensation, and it transforms the role of the senior leaders. For the companies that get it right, Carpenter says, the benefits are impressive: reclaimed market share, higher profits, more innovation and more productive and engaged employees. Meanwhile, the less-successful companies remain mired in an endless cycle of incremental measures that fail to address the underlying causes of stagnation. Paul Dailing contributed to this report.